Dancing plays an important role in Azerbaijani culture. This ancient and very rooted artistic expression is very peculiar in Azerbaijan and differs sensibly from other countries. The art of dancing in Azerbaijan is as old as the time. The very unique element that distinguishes Azerbaijani dance from all other type of dance is the quick temp and fast movements, also supported by the employment of the traditional clothes, that brilliantly create a strong and evocative atmosphere. The quick pace is also a strong characteristic of the Azerbaijani people, that’s why it is also reflected in the art of dancing, making it so unique. National dances are performed at the same time by common people and professional dancers. In the past, most Azerbaijani khans used to keep professional female and male dance groups in their palaces. A very special time for dance in Azerbaijan is the holiday of Novruz, which is celebrated as the New Year and the beginning of Spring (March 21–22). Novruz ends with many public dancing events and music entertainment. Abayi dance is an Azerbaijani dance with features the middle-ages as its main theme. This is due to the fact that it was generally performed by middle-aged men or women. Agir Kadaragi is a dance created in Karadakh and is quite a slow dance compared to the usual rhythm of Azerbaijani dance. Acha Gulu is a traditional dance dating back to the beginning of last century created by Ali Karimov and is performed by women with fast movements. Anzali is an Azerbaijani dance created in Baku and it is aimed at old people, that’s why it is performed quite slowly. It’s a traditional dance dating back to the end of 1800 and is also well respected by young people. Asma Kasma is the oldest Azerbaijani dance which is comprised of a lot of jumps. It was performed traditionally at marriages by women. 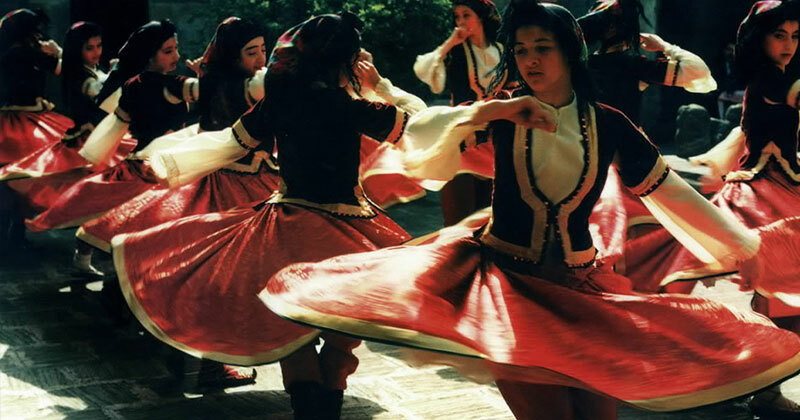 These are just a few of the many traditional and modern dances of the Caspian Region. There are dozens of dance styles in Azerbaijan, as a result of a very creative and joyful people that never miss a chance to celebrate life and to look at their special moments with joy and enthusiasm.